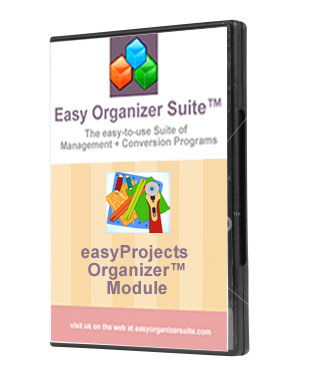 The easyProjects Organizer™ Module helps you organize your projects. You can put your projects in one or more categories and add keywords to them to help you find them easily. It can contain links with Embroidery File Charts in easyEmbroidery File Organizer™ as well as charts in other Modules. You will receive an Activation Key to unlock the Standard Edition features of the easyProjects Organizer™ Module. If you choose to purchase the CD, it will be mailed to you. The easyEmbroidery File Organizer Module keeps track of your embroidery files. It shows your embroidery files in categories that you define, and each embroidery file can be in multiple categories. The Standard Edition includes all the basic functionality of the program. You will receive an Activation Key to unlock the easyEmbroidery File Organizer Module. The easyFabrics Organizer™ Module keeps track of your fabrics. It can contain links with Website Charts in easyWebsites Organizer as well as charts in other Modules. You will receive an Activation Key to unlock the Standard Edition features in easyFabrics Organizer™ Module. The easyThreads Organizer Module keeps track of your threads and converts from one brand to another. The Standard Edition includes all the basic functionality of the program. You will receive an Activation Key to unlock the Standard Edition features of the easythreads Organizer Module.